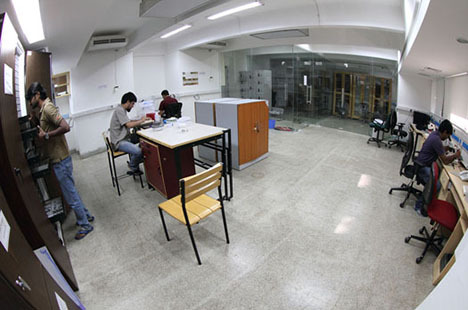 NCBS maintains an air-conditioned, completely climate-controlled Research Collections unit. It holds biodiversity-related materials that are important for our taxonomic, phylogenetic, population genetic, and other evolutionary, ecological and conservation research. The collections contain dry (e.g., insects) and wet materials (e.g., herpetofauna and marine arthropods preserved in ethanol and formaldehyde). There is an adjacent but separate desk and work area for curators and research scientists working in the Research Collections. The long-term goal of this facility is to maintain world-class, modern research collections that include geo-referenced data and a DNA library for all specimens, with the associated information centrally databased. The facility is well-equipped with microscopes, imaging station, work desks, deep freezers, and instruments and supplies required for systematic, evolutionary and ecological work of various kinds. We envision this facility to form a long-term reference and a major resource for any modern biodiversity-related work in India. We have already developed substantial collections of dry and wet specimens and deep-frozen tissue samples. As a result of research projects by NCBS faculty as well as international collaborations, we have some of the most extensive modern collections of Indian butterflies, cicadas and their endosymbionts, which are being used in global phylogenetic projects. We are international academic partners in two major Genealogy of Life (GoLife) projects funded by the National Science Foundation (NSF, USA), through which we are trying to understand the evolution and diversification of Indian amphibians and butterflies in the global context. We are also partnering in preparing global phylogenies of cicadas and fireflies to understand evolutionary relationships and diversification of Indian species in these groups. Contact us if you wish to engage with this research collections facility or to collaborate in any biodiversity-related projects in India.